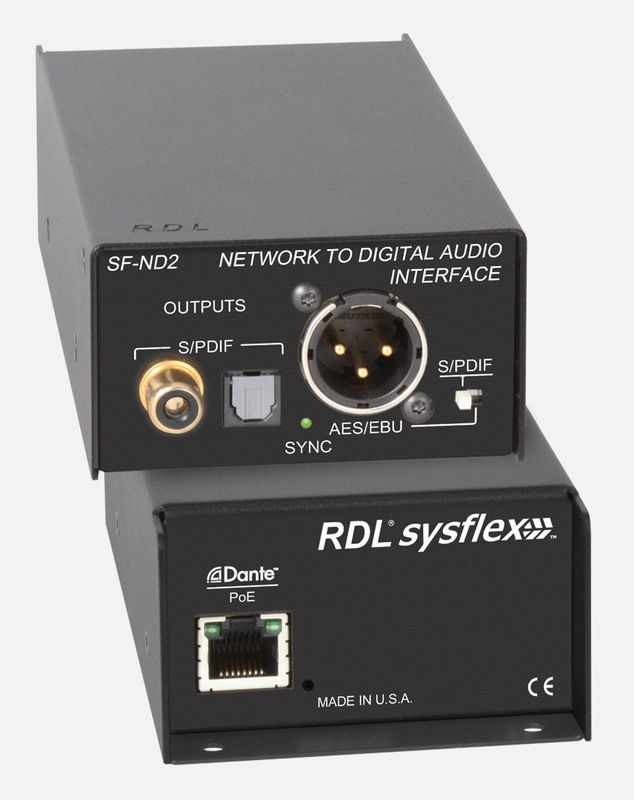 Sysflex is a family of modules which interface between DANTE data networks and analogue and digital audio devices. Microphones, AES/EBU and SP/Dif digital signals, as well as USB connections, can be used as feeds into the network, depending on model. There are also modules to take signals from the network and present them to both analogue line-level and digital audio inputs, headphones and even one module with an output to feed loudspeakers. A range of hardware is offered to assist in mounting the modules. Special software is not required for module setup. For more details concerning networking, please see DANTE Networking Basics. All are contained in a metal case 147mm deep and 42.7mm high. There are three module widths. All modules, apart from the SF-NP40D, are powered over the network connection, using power from a suitable switch offering POE to Class 0, IEEE 802.3af. They each have a single RJ45 connector on the rear for connection to the network. This has two LEDs, one indicating a 100Mbps connection, the other indicating 'data activity'. All may be mounted on a flat surface using the holes for fasteners at the rear. Alternatively they may be mounted under a table or counter, in a rack or on a microphone stand thread using optional accessory brackets and adapters. Protocol: DANTE. Transmission rate: 100Mb/s. Sample rates supported: 44.1, 48 (default), 88.2, 96kHz. Bit depth supported: 24 bits. Audio operating level: -20dBFS = +4dBu. Reference level: 0dB FS = +24dBu. This can interface two, two-channel/stereo, digital, audio sources to the DANTE network, the signal remaining in the digital domain all the way through to the DANTE network output. 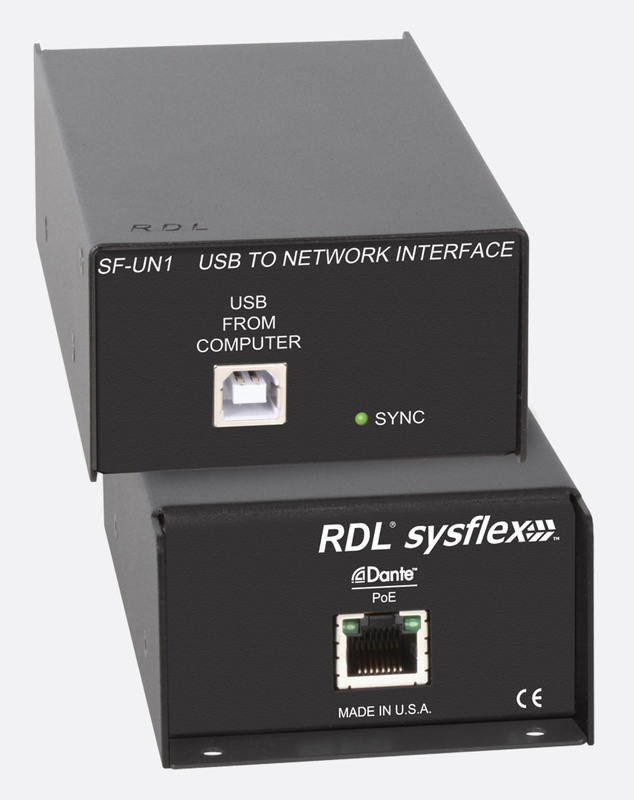 It selects automatically the first valid signal on any of the three connectors available to each connection, which is then decoded, re-clocked and transmitted to the DANTE network. Inputs: Two sets of connectors on the front panel, each set containing 3 connectors, a 3-pin, balanced female XLR connector for an AES/EBU connection and both RCA (phono) and optical connections for S/P Dif. Each set has a corresponding 'Lock' indicator, 'for Valid Inputs'. A separate LED indicates 'valid power' and synchronisation to a master clock. Input sampling rates: 44.1kHz to 192kHz. DANTE sample rates: 44.1, 48, 88.2, 96kHz, 'selectable'. This module is 110.5mm wide. This converts a stereo USB digital audio source to two DANTE network audio channels. It automatically detects a valid USB input, which is decoded, re-clocked and transmitted to the network, providing automatic sample-rate conversion. Input: One Type B USB receptacle on the front panel. An LED indicates 'valid power' and synchronisation to a master clock. USB input sampling rates: 32kHz, 44.1kHz and 48kHz. DANTE sample rates: 44.1, 48, 88.2, 96kHz, 'selectable'. This module is 73.7mm wide. 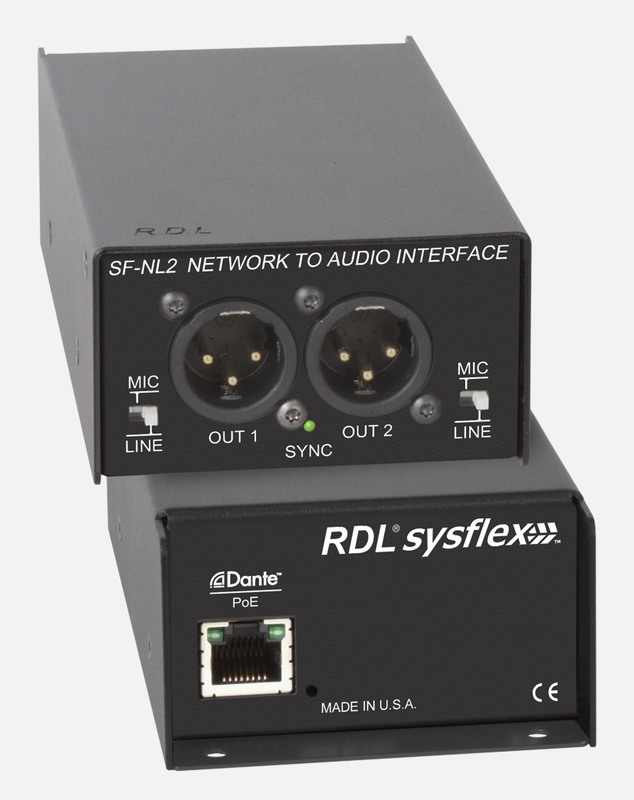 SF-XMN4 - Four microphone inputs to DANTE network. This can interface four microphones, dynamic or condenser, to the DANTE network, using 'high resolution 24 bit analog to digital conversion'. Inputs: Four female, 3-pin XLR connectors on the front panel, each with a switch 'to set the gain for dynamic or condenser microphones', 40dB, 48dB or 62dB, and two LEDs to display the level to 'facilitate selection of the ideal gain range'. P48 phantom voltage is supplied to each microphone input. A separate LED indicates 'valid power' and synchronisation to a master clock. Input level: -36/-44/-58dBu, Low/Medium/High, for +4dBu/-20dBFS; -16/-24/-38dBu, Low/Medium/High, maximum. Input impedance: More than 2.5k ohms. CMRR: Better than 65dB, 50Hz to 120Hz. Phantom power: P48, 48V DC, IEC 61938: 2013. Response: 20Hz to 20kHz, +/- 0.5dB. Noise: -130dBu EIN at 62dB gain, -132dBu A weighted; -72/-72/-68dB, Low/Medium/High, referred to -20dBFS, 20Hz to 20 kHz. Distortion: Better than 0.1% THD+N:, 20Hz to 20kHz, +4dBu/-20dBFS; .015%THD+N: at 1kHz. Crosstalk: Below noise floor, 20Hz to 20kHz at operating level, any input to any input, maximum microphone gain. This module is 110.5mm wide. 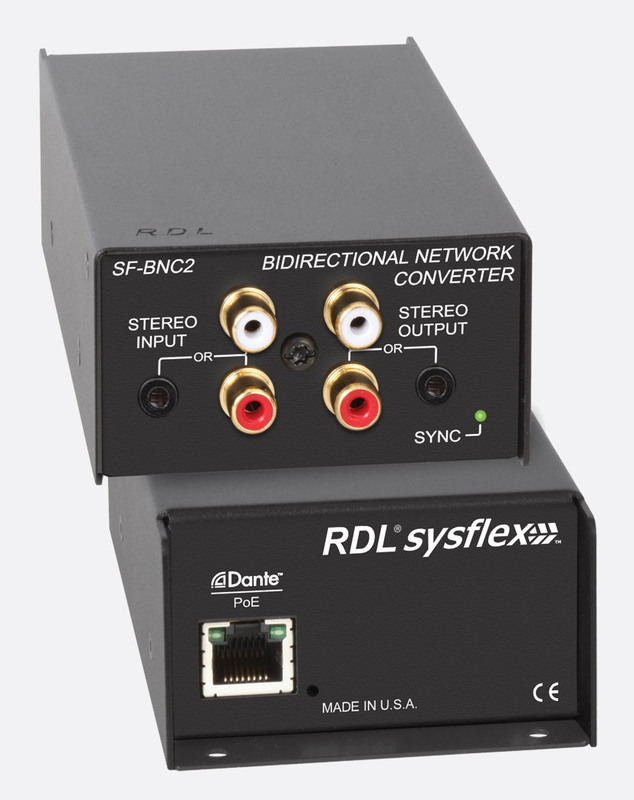 SF-BNC2 - Bidirectional - Unbalanced stereo audio to and from the DANTE network. This interfaces two unbalanced analogue inputs to two DANTE channel and two more DANTE channels to two analogue audio outputs. Inputs: The front panel has two RCA (phono) connectors for audio inputs; alternatively the stereo, 3.5mm, jack may be used. Each input provides a network digital audio level of -20dBFS for an unbalanced -10dBV input. An LED indicates 'valid power' and synchronisation to a master clock. Outputs: The front panel also has two RCA (phono) connectors and a stereo 3.5mm jack for unbalanced audio outputs. Each output provides an unbalanced, -10dBV signal for a network digital audio level of -20dBFS. Line inputs to network interface - Input: -10dBV nominal for +4dBu/-20dB FS; +10dBV maximum; 15k ohms. Response: 20Hz to 20kHz +/- 0.5dB. Noise: Better than 80dB below -20dB FS, 20Hz to 20kHz). Distortion: Less than 0.05% THD+N, 20Hz to 20kHz, -20dB FS; 0.02% at 1kHz. Crosstalk: Better than -85dB, L into R, R into L, 20Hz to 20 kHz. Headroom: 20dB. Network interface to line outputs - Output: -10dBV nominal, +10dBV maximum, 40ohms output impedance. Response: 20Hz to 20kHz +/- 0.5dB. Distortion: less than 0.1% THD+N. Noise: Better than -75dB below -10dBV. Crosstalk: Less than -70dB, 20Hz to 20kHz. Headroom: 20dB above -10dBV. This module is 73.7mm wide. 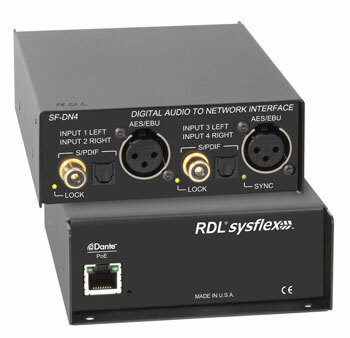 This converts two DANTE network channels to a two-channel, digital audio output. Outputs: On the front panel there is a 3-pin, transformer balanced, male XLR connector for an AES/EBU connection and both RCA (phono) and optical connections for S/P Dif. A switch is provided, marked 'AES/EBU' and 'S/PDIF' to enable 'appropriate output jack and any required electrical and data format conversion'. A separate LED indicator indicates 'valid power' and synchronisation to a master clock. This module is 73.7mm wide. 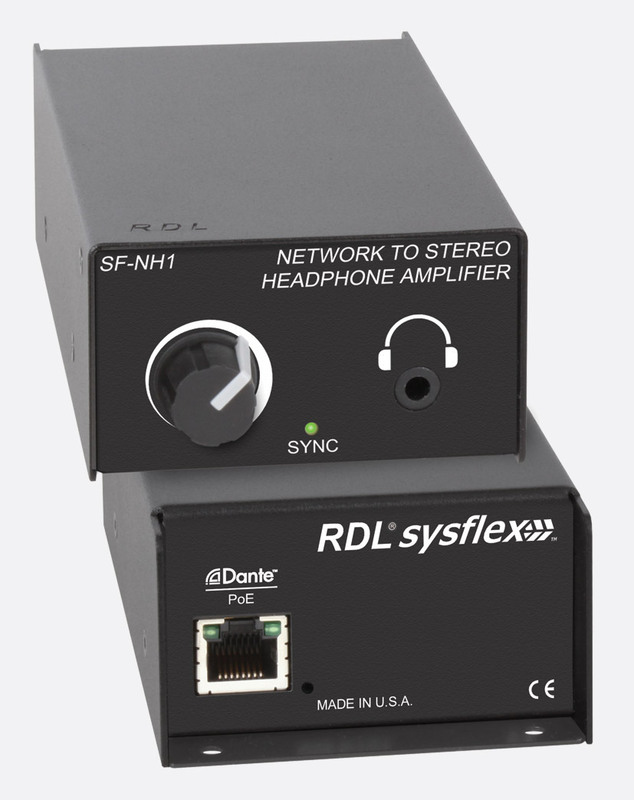 This converts two DANTE network audio channels to a stereo headphone output, with a volume control on the front-panel. Output: The front panel has a stereo, 3.5 mm jack socket and a rotary volume control. An LED indicates 'valid power' and synchronisation to a master clock. Outputs: 0dB FS = 150 mW into 100ohms, maximum. Output impedance: Less than 50ohms. Response: 20Hz to 20kHz +/- 0.5dB. Distortion: Better than 0.05% THD+N, 20Hz to 20kHz, -20dBFS; 0.015% at 1 kHz. Noise: -75dB, below -20dBFS; -95, below 0dBFS. Crosstalk: Better than -80dB, 1 kHz, -20dBFS. Headroom: 20dB, above -20dBFS. This module is 73.7mm wide. This converts two network channels to two balanced, 'line-level', audio outputs with XLR connectors. Each channel 'provides +4dBu balanced for a network digital audio level of -20dBFS'. Each output is 'equipped with a selector to set the output to line level or attenuate the output by 50dB to mic level'. Output: Two 3-pin, male, XLR connectors, each with an adjacent, two-position, switch marked 'Mic' and 'Line'. An LED indicates 'valid power' and synchronisation to a master clock. Output level: +4dBu, nominal line level, balanced or -45dBu nominal microphone level, into 150 ohms, operating; +24dBu line level maximum. Output impedance: Less than 100 ohms. Response: 20Hz to 20kHz +/- 0.5dB. Distortion: Less than 0.1% THD+N, 20Hz to 20kHz,+4dBu/-20dBFS; 0.015% at 1 kHz. Noise: Better than -75dB below +4dBu; -95 below +24dBu. Crosstalk: Below noise floor, 1kHz, output to output; Less than -60dB, 20 kHz. Headroom: 20dB above +4dBu/-20dBFS. This constant voltage amplifier module converts a single DANTE network channel to a single amplified output to suit 70V or 100V line loudspeakers. An LED on the front-panel illuminates when the module is powered, by the included external power supply, via the coaxial power inlet on the rear panel. The module is equipped with both thermal and output short-circuit protection. The 'high-efficiency Class D output stages produce minimal heat for all levels of expected voice or music modulation'. Outputs: The front panel has a detachable terminal block connector providing a balanced output to two loudspeakers. An LED indicates 'valid power' and synchronisation to a master clock. Response: 50Hz to 20kHz +0,-3dB. Distortion: Less than 1% THD+N, 1kHz. Noise: Less than -90dB, below maximum power; less than -80dB, below 1/8 power. As per SF-NP16E however this amplifier module has a constant output of 35W into 70V or 100V line systems. As per SF-NP16E however this amplifier module has a constant output of 50W into 70V or 100V line systems. An additional automatic ducking system, controllable via network or switch-selectable analogue input has a switch-selectable attenuation of -25dB or ‘off’. This module converts two DANTE network channels to two amplified outputs to suit 4 or 8 ohm loudspeakers. An LED on the front-panel illuminates when the module is powered, by the included external power supply, via the coaxial power inlet on the rear panel. The module is equipped with both thermal and output short-circuit protection. The 'high-efficiency Class D output stages produce minimal heat for all levels of expected voice or music modulation'. Outputs: The front panel has a detachable terminal block connector providing a balanced output to two loudspeakers. An adjacent switch selects between 4 ohm and 8 ohm loudspeakers. An LED indicates 'valid power' and synchronisation to a master clock. Each output provides 20 watts into 8 ohms for a network digital audio level of 0dBFS. Output level: 0dBFS = 20W into 8ohms per channel; 15W into 4ohms, maximum. Load impedance: 4 or 8 ohms, selected by switch. Response: 20Hz to 20kHz +0,-6dB. Distortion: Less than 0.1% THD+N, 20Hz to 20kHz,+4dBu/-20dBFS; 0.015% at 1kHz. Noise: Better than -80dB, below 20W into 8 ohms. Crosstalk: Better than -75dB, 1kHz, output to output. Headroom: 20dB above -20dBFS. This module is 92.2mm wide. This 50W amplifier is designed to convert a single, mono or stereo analogue input into a 50W constant voltage output to 70V or 100V systems. An internal VCA can be used for setting the amplifier output power. Input is via balanced terminal block or stereo unbalanced 3.5mm jack socket, whilst all output connections are via removable terminal blocks. Balanced input level: +4dBu, nominal, -10dBu, miniumum; +25dBu, maximum. Unbalanced input level: -10dBV, nominal; -25dBV, minimum; +10dBV, maximum. Response: 50Hz to 20kHz +0,-3dB. Distortion: Less than 1% THD+N, 1kHz. Noise: Less than -90dB, below maximum power; less than -80dB, below 1/8 power. Any Sysflex module can be mounted on this sloping adapter, snapped in and then 'secured by one single screw'. It has an aperture for fixing to microphone stands with a 5/8 inch 27 TPI thread. Adapter 53-217 will convert this to the 3/8 inch thread more commonly found in Europe. For alternative adapters, see Thread Adapters. Dimensions: 55.9 x 38.1 x 142.2 (w x h x d) mm. 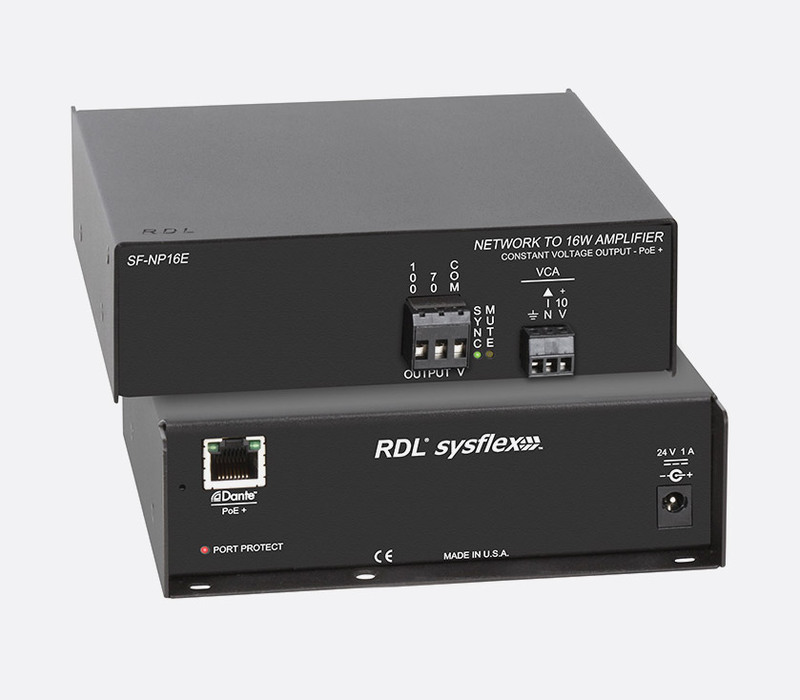 The SF-RA1 rack mounts several SysFlex modules in fixed or mobile installations. Modules may be combined up to a width of 430mm; they 'quickly snap into the SysFlex rack mount and each is firmly secured with a single screw'. The racking system 'segregates network and power wiring from the audio and digital audio connectors'. The front panel is blank. Dimensions: 1U, 19-inch rack mounting, 25.4mm deep. Two bent, metal, brackets fit under a Sysflex case and are secured using two screws (included) each. The brackets may then be fastened to the underside of a counter, shelf or table using fasteners (not included) through the two, slotted, mounting holes in each bracket.